Is this guy just trolling these two brothers? Nah. I’ve tried not to spoil anything in this review. Brothers: A Tale of Two Sons (out on PS3 and Xbox 360 now, Steam at some time soon) is something you need to experience for yourself, so if you’re in any doubt – as much as I hate to say this – stop reading now! Brothers: A Tale of Two Sons is, essentially, a tale about loss and how two brothers deal with it. At least, that’s what I think it’s about. I say it’s about loss because the game opens with the younger of the two brothers mourning the death of his mother, her headstone looking out from a hilltop over a calm sea. The boy sobs gently as he remembers his mother but his sorrow is short lived, as he soon has to help his older brother get his clearly ailing father to the village doctor – and their quest begins to search for the remedy. Brothers is one of those games where quiet, contemplative moments are common (there are even benches dotted around the environment where one or both of the brothers can sit and soak up the stunning vistas, and they are truly are stunning) but it’s also one of those games that has a moment near the end so profound that it alters the whole shift of the game. I wish I could tell you about it but it’ll spoil the whole game. Let’s just say it’s a profound event. 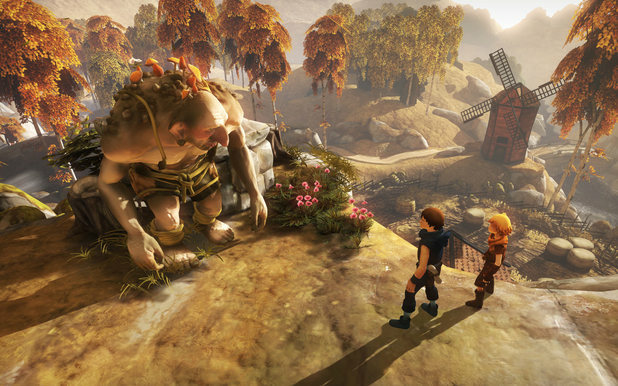 Brothers: A Tale of Two Sons is a single player co-operative game where you control both brothers, at the same time in an effort to save their father, and while most of the time you control the brothers individually, the game really shines when you have to combine the talents of the two to solve the game’s simple puzzles. The left stick controls the older, stronger brother, while the right stick controls the younger, more agile sibling. The trigger buttons let each brother interact with the environment. It’s not a perfect control system – an hour or so into the game I was still managing to steer one or other brother into a wall or pillar every now and then – but sometimes it just shines, especially a moment when the pair have to control a gilder as it soars through the air. It’s also clear from the beginning that although the pair speak in some nonsensical language (somewhat similar to the language spoken by Sims), the boys have very different personalities – and that comes out in they way the boys interact with their surroundings. When the pair come across a fellow villager tending to some plants, the younger boy slaps him playfully on the backside, while the older boy tries to placate him. The younger boy plays a villager’s harp beautifully, while the other plays it dismally. 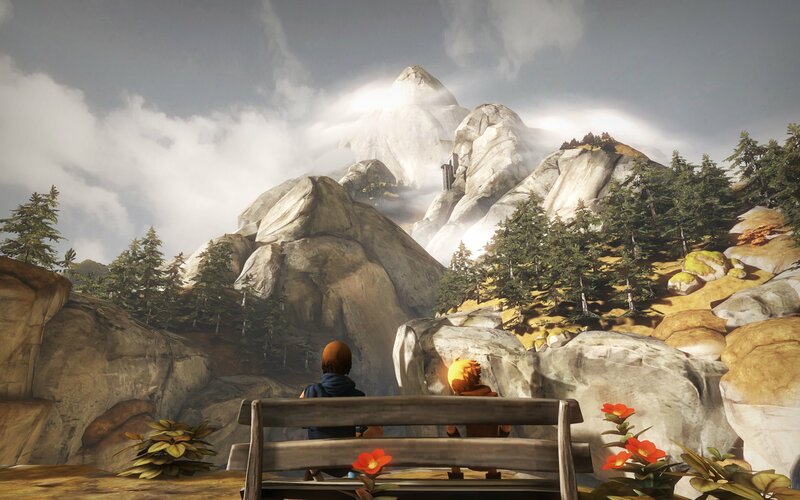 The game play is simple enough: environmental puzzles – for example, in one location, the younger boy will turn a handle to open a gate while the older boy clings to a chain handing from a conveyor belt – ledge grabbing and climbing and as the boys’ journey continues they’ll come across a variety of landscapes and inhabitants, including rock trolls, the remnants of a battle between giants and a snowy wonderland. In one scene as the boys traverse an underground mine (sometimes you can see trolls down below swinging pick axes), they come across a troll trapped inside a locked cage. The only problem is that the key to the lock is on the belt of a nearby guard, who stands behind two gates. As I guided the younger of the boys through the first gate then negotiated piles of human bones , I couldn’t help but smile as he started tip toeing across, careful not to disturb the bleached white bones for fear of attracting the attention of the guard troll. Brothers: A Tale of Two Sons won’t take an age to finish – I think I finished it in around three hours (I wasn’t counting but it was done over an evening) – but I was captivated the entire time, even though the puzzle solving won’t tax those wanting to test their grey matter and the game play is a little safe at times. This is a game that plays like it’s set in one of Grimm’s fairy tales and to be honest the control system only caused me problems during on chase sequence where I died once until I’d worked out the layout of obstacles in the boys’ path. This is a game that has an ending that comes as a surprise and one that shows the game’s makers weren’t afraid to push the boundaries a little and give gamers’ something to think about. The team at Starbreeze and 505 Games deserve any accolades they receive for this game: It’s one of the most memorable I’ve played this year. You can probably tell I loved Brothers: A Tale of Two Sons. It’s haunting, it’s captivating, and I could play games like this until the cows come home (I’m not sure what that phrase means, considering I’m not a farmer but I’m hoping it means that I’ll be doing something for a long, long time). I liked it. A lot.